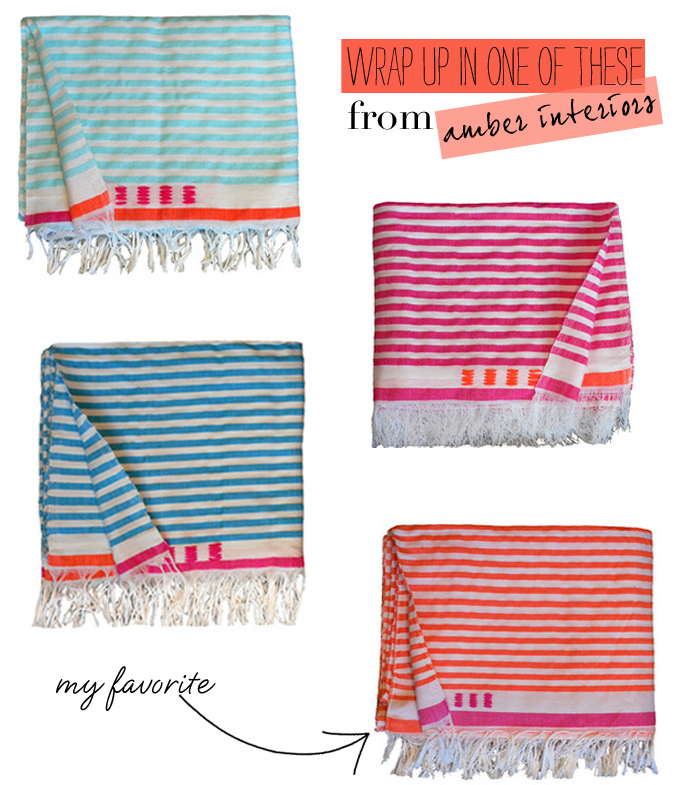 I know the last thing we’re all thinking about during these triple digit temperatures is wrapping up in a other than a beach towel, but these handmade striped blankets from Shoppe by Amber Interiors are just too good. I came across them a couple of days ago and they’ve been on my mind ever since. They’re a perfect combination of two of my favorite things: stripes and brights. All of the colors are so fab (the orange/pink version is my favorite, naturally) One of these would be just the thing to punch up any couch or bed. For now, I think I’ll use it as a beach blanket. This looks like the perfect summer blanket!! Love. I love the blue strip with pink and orange! They are all so pretty! Fun find! Those are gorgeous! The aqua stripe is my favorite!! I'll just take a nap on it when i go to the beach this summer…so pretty! Ah these are gorgeous. Love the colors that they use. So unique! Love it! Does Alison not blog anymore? These are seriously my favorite blankets I've seen lately! The colors are just so pretty! great blankets! thanks for sharing. Hope you have a great weekend! I have been lusting over the orange and pink one on the bottom for a few months now. They look so comfortable and would be a great pop of color on the couch!